Thirty thousand had seen the Braves and Cardinals split a Sunday twin bill on September 14; a reported 5,000 ventured out to Braves Field for this midweek action, which followed two offdays but competed with a parade also taking place in downtown Boston.10 Even in the middle of the week and with a free parade, fans with limited spare dollars were getting another doubleheader, and knew that their prize rookie’s steady production was still solid late in the season – Berger had reached base by hit or walk in 16 of the 17 games in the extended homestand. To boot, Cincinnati, “Porkopolis” to Boston Post writer Paul Shannon,11 came to town dragging a 12-game losing streak. Right-hander Socks Seibold, out of the majors for 10 years before resurfacing with the Braves in 1929, started the opener for the locals and spun a complete game, shutting out Cincinnati in all but the seventh inning, when the Reds touched him up for three runs. By then the Braves already had five of their own. Berger had gotten things started with an RBI single off Benny Frey in the first inning, then drilled a two-run homer in the third that ended Frey’s day. McKechnie gave Seibold enough leash to finish what he started and Lance Richbourg’s great defensive work in right field helped, too. The Braves tacked on an insurance run in the eighth to win, 6-3. Berger was 2-for-4 with a run scored on the home run, his 35th of the year. He’d moved his RBI total to 112. He wasn’t finished. Although the scoring in the second game was essentially a turnabout from the first, with Cincinnati’s Red Lucas12 staked to a 5-0 lead through five innings,13 Berger got to work in the sixth. He broke up Lucas’s shutout bid with a two-out solo homer, then victimized the right-hander again with a three-run shot, number 37, in the eighth. Before these pyrotechnics, both “full-blooded” and “smashed” to left field,14 he’d added his 27th double of the season. The Berger barrage drove in all four Boston runs, but the one-man offense wasn’t enough as Cincinnati finally snapped its losing streak at 13 with a 6-4 win. Despite his difficulties with Berger, Lucas managed a complete game and helped his own cause with a two-run single and a run scored. Berger, Walter Anton, and George Morris Snyder. Freshly Remember’d (Redondo Beach, California: Schneider/McGuirk Press, 1993). Bevis, Charlie. Doubleheaders, A Major League History (Jefferson, North Carolina: McFarland& Company, Inc., 2010). Fuchs, Robert S., and Wayne Soini. Judge Fuchs and the Boston Braves, 1923-1935 (Jefferson, North Carolina: McFarland & Co., Inc., 1998). James, Bill. The Bill James Guide to Baseball Managers from 1870 to Today (New York: Simon and Schuster, Inc., Scribner, 1997). Johnson, Richard A. Images of Sports: Boston Braves (Mount Pleasant, South Carolina: Arcadia Publishing, 2001). Kaese, Harold. The Boston Braves (New York: G.P. Putnam’s Sons, 1948). Reichler, Joseph L. The Great All-Time Baseball Record Book (New York: Macmillan Publishing Co., Inc., 1981). Vincent, David W., ed. Home Runs in the Old Ballparks (Cleveland: Society for American Baseball Research, 1995). Brattain, John. “Blast From The Past: Wally Berger,” The Hardball Times.com, April 22, 2005 (accessed November 1, 2014). O’Leary, James C. “Berger Has Three Homers in Braves Double-Header,” Boston Globe, September 18, 1930. Shannon, Paul H. “Berger Makes Three Homers,” Boston Post, September 18, 1930. Whitman, Burt. “Braves Split with Reds, 6-3, 4-6, as Berger Knocks Three Homers and Smashes in Seven Runs,” Boston Herald, September 18, 1930, 36. BallparksofBaseball.com, Braves Field (accessed October 7, 2014). Baseball-Almanac.com, Single-Season Rookie RBI Records (accessed November 1, 2014). Braves.com, All-Time Statistics Totals (accessed October 30, 2014). 1 The 62 games in those 31 doubleheaders comprised slightly more than 40 percent of the Braves’ 154-game schedule. Retrosheet.com. 2 Caruso, The Braves Encyclopedia, 297. 3 When St. Louis was swept in the 1928 World Series by the Yankees, owner Sam Breadon demoted McKechnie to managing the Cardinals’ farm team in Rochester and brought Rochester manager Billy Southworth to St. Louis for 1929. By July McKechnie was back. He left St. Louis with Breadon’s blessing when the Cardinals were unwilling to offer a contract in excess of two years; Judge Fuchs, who had talked to Breadon about McKechnie’s possible availability, signed him for three years. Kaese, The Boston Braves, 212-213. 4 Berger was 24 when he debuted with the Braves on April 15, 1930. After two failed tryouts with his hometown San Francisco Seals, he was already 21 and playing company-team baseball in Montana when friends secured him a spot with Pocatello in in the Class-C Utah-Idaho League during the 1927 season. He quickly advanced to the Pacific Coast League Los Angeles Angels for 1928, and had a breakout season there with 40 home runs in 1929. Fuchs gave the Angels two players and cash for the rights to Berger and signed him to a $4,000 contract for 1930. Kaese, 215; Fuchs and Soini, Judge Fuchs and the Boston Braves, 100. 6 Bill James ranks Berger as the best center fielder to play for McKechnie, whose managerial career began in the Federal League in 1915 and spanned 24 major-league seasons, with four pennants and two World Series titles. James, The Bill James Guide to Baseball Managers, 107. 7 McKechnie moved Berger to center field for 1931. He remained there for the remainder of his Boston career, which ended with a trade to the Giants on June 15, 1937. Jimmy Welsh played 110 games in center for the 1930 Braves. He was traded to the Cubs during the 1930-31 offseason, opening center field for Berger, who combined good range and a strong arm with his slugging. 8 Del Bissonette of the Brooklyn Robins had hit 25 home runs as a rookie in 1928. Baseball-Reference.com. 9 Berger and Snyder, Freshly Remember’d, 120. 10Whitman, “Braves Split with Reds,” Boston Herald, September 18, 1930. 11 Shannon, “Berger Makes Three Homers,” Boston Post, September 18, 1930. 12 Lucas is remembered as one of the best-hitting pitchers in baseball history, often used as a pinch-hitter in his career with four NL teams. He had a .423 on-base percentage in 137 plate appearances in 1930 and hit .281 over 16 seasons. 13 The Braves had clinched sixth place over Cincinnati with the win in the first game. McKechnie started rookie Ken Jones in the second game. It was the only start in his major-league career; he lasted only into the fourth inning. Despite pitching only 21⅔ innings over nine games in the majors, Jones managed to get himself a nickname, “Broadway.” Shannon. 15 “Not only did [Wally Berger] hit home runs in quantity, but he was also forced to hit most of his home runs the proverbial ‘country mile,’ the large expanse of Braves Field, against a prevailing north wind.” Johnson, Boston Braves, 52. 16 “A new Babe Ruth seemed to be coming to life in Boston.” Fuchs and Soini, 84-85. 17The final RBI on September 17 tied Jimmy Williams’s (Pittsburgh, 1899) rookie RBI record. Berger broke it with No. 117 on September 21. He finished the 1930 season at .309/.375/.614 with 38 home runs and 119 RBIs. His 38 home runs upped the then-existing major-league rookie record by 13 and is still the National League rookie standard, tied in 1956 by Frank Robinson of Cincinnati. Berger’s 119 rookie RBIs were the major-league record until Ted Williams drove in 145 in 1939. His NL rookie RBIs record lasted longer – until Albert Pujols (St. Louis) drove in 130 in 2001. Reichler, The Great All-Time Baseball Record Book, 281, 284; Brattain, Blast From The Past: Wally Berger. Berger was certainly the top National League rookie in 1930, but not “Rookie of the Year.” The ROY award wasn’t instituted until 1947. 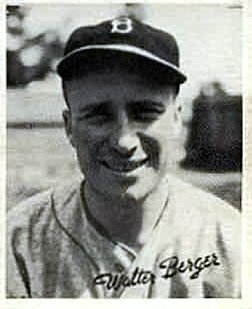 18 Berger led the Braves in home runs and RBIs every season from 1930 through 1936. He was selected to the first National League All-Star team, in 1933, and again in 1934 through 1936. He stands second (.533) to only Henry Aaron (.567) in career slugging percentage for the combined Boston-Milwaukee-Atlanta franchises. Braves.com. Berger won two-thirds of the National League Triple Crown in 1935 with 34 home runs and 130 RBIs. Baseball-Reference.com. His 103 home runs in Braves Field are the most by a Braves hitter, and he added two more there while playing with other teams. Vincent, Home Runs in the Old Ballparks. 19 Berger and Snyder, 185-186.